Anushree Reddya��s upcoming wedding collection at Lakme Fashion Week keeps it modern and minimal. 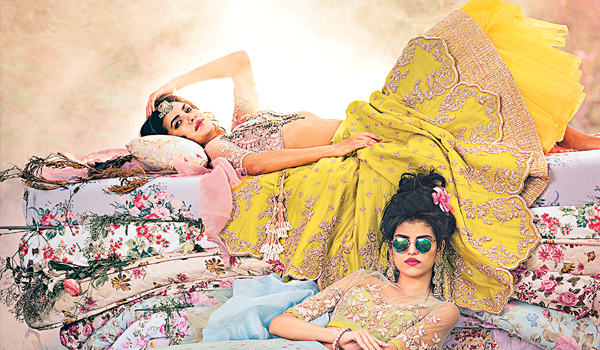 Floral and feminine, Hyderabad-based Anushree Reddya��s collection celebrates opulence. Drawing inspiration from Victorian to Mughal eras, previous runway ensembles from the designera��s six-year-old eponymous label are well remembered. Case in point, Shruti Haasana��s ivory chanderi lehenga with floral zardosi work at the Lakme Fashion Week Summer/Resort 16. As Reddy gears up to showcase bridal couture, The Wedding Chronicle, at the upcoming Winter/Festive edition of LFW, we catch up with her for a sneak peek. Reddya��s love for zardosi and raw silk fabrics shines through. a�?I think they make an ethereal combination,a�? she begins, adding that there will be traces of the Mughal era in The Wedding Chronicle as well. So whata��s new? Not one to give up on florals, Reddy has brought in a vibrant colour palette (fiery reds, rani pinks and yellows) compared to the ivories and pastels in her previous collections. a�?My pieces symbolise a confident bride who is probably planning everything at her own wedding. So the outfits are going to be strong demi bridal pieces featuring an amalgam of floral and geometric patterns,a�? she explains. As for experimental factors, fashionistas can expect quite a few numbers featuring capes. Famous for putting up star-studded shows with her showstopper list, including model-turned-actor Nargis Fakhri, the 30-something hints that Bollywood might be onboard with her show this time. a�?I am also looking forward to the opening of my new store in Delhi,a�? she signs off.